Sour Apple for Chubbs, Cherry for Benji and Strawberry for Phoebe - YUMMY! Besides cookies and cakes, I've been stocking up on all sorts of candies for the upcoming Aidilfitri celebration. From lollipops and jelly beans to mini chocs and butter cookies, the whole place smells like a delightful chocolate candy store! It's not like we're expecting many guests but it's always good to keep some candy around for the little ones. 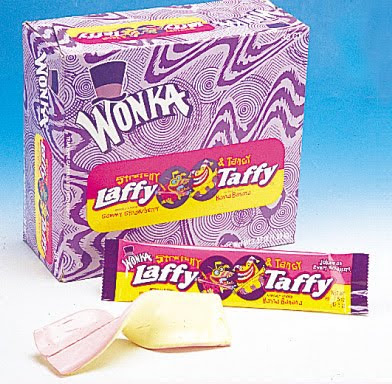 Kids love candy especially the long-lasting flavorful chews of wonka laffy taffy candy. And my guests will definitely appreciate me serving candy to distract their kids while we grown-ups catch up on old times. 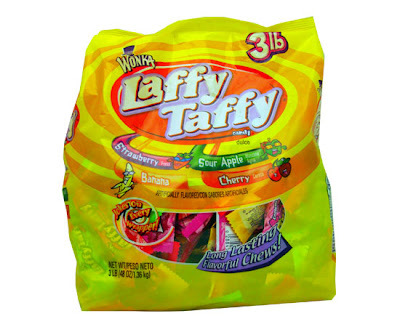 Stretchy and tangy, laffy taffy candy comes in so many yummy flavors that it's hard to pick just one but my favorite is the Strawberry/Banana, which also makes a delightful ice-cream flavor don't you think? The taffy is a pastel pink in color, so it not only looks sweet but smells equally delicious as well! So right now, our kitchen cabinet is stuffed with delicious-smelling candy, which I plan to sort into decorative candy jars later today. I've already washed out all the candy jars and they're waiting for me on the dining-table, ready to be filled with delicious candy and cookies. I've been hiding the candy bags from B though because when it comes to candy, he immediately turns into Cookie Monster; chewing away non-stop especially when he thinks I'm not looking! B has officially started his Raya holiday so he'll be at home the whole day. It's going to be tough sorting out my candies with B around so I'm going to need Phoebe's help to distract him while I arrange my cookies and candy. Thank you for reading and don't forget to grab some yummy laffy taffy candy on your way out! Recent blog:=- Chp 266. Wedding Planner: Invitations! Recent blog:=- Friday Fill-Ins: PH, My bathtub, Shopping! Morning mon :D Long time. Am on vacation so net speed is slow, hence most of the pages don't load, except at this time. Its 6am over here. hihi. Hi Ane, long time no see sweetie! Welcome Mon, now I have one more candy post to do he he! WooHoo! i made it! it's been sooo long since I last chopped!!! The BV one some more….I think that one due tomo, not sure la! Must check later…u finished dropping edi or not? Yay! U going to zzzz? My BV one is due on Sun I think…still got time phew! I find it very strange when I see the word 'taffy' although in some parts of the North it may be pronounced this way in Britain, most of us say it as it's spelt .... toffee. I wonder how people in other parts of the world say this particular sweetie? Just wanted to say hello from all of us. There are a lot of us here at this place, around 20 cats and other animals too. This is my favorite candy! You can't beat the banana. I actually pick the banana out and hide them.